Remembering the photo of my grandmother when she arrived in Rarotonga, tears streaming down her cheeks, as she is laden with ei tipani upon ei tipani, till all you can see is her sad, but happy face. Remembering my great uncle’s funeral, where his coffin, on return from Rarotonga was filled with ei tipani that filled the PIC Newton church with the scent of family, community and village. Remembering the day when family arrived from Rarotonga wearing ei tipani and we all had the chance to reconnect, rejuvenate and re-establish, through wearing one flower in my ear. Remembering the time(2am) I arrived in Rarotonga for the first time, and all I could smell was ei tipani. The knowing at that moment, that I was home. Priceless. Theres something that is indefiantly settling in the scent of the Frangipani. By Tai Paitai. 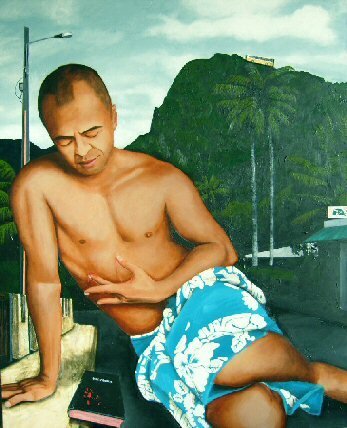 Painting: Candy Bible Stories by Nanette Lela’ulu.